Bangkok's Grand Palace is the granddaddy of the many things to see in Thailand's capital city. The sprawling complex houses ornate structures that speak to the grandeur of Thai architectural tradition and history. Built in 1782, the palace was commissioned by then-king Rama I, who founded Thailand's Chakri Dynasty. 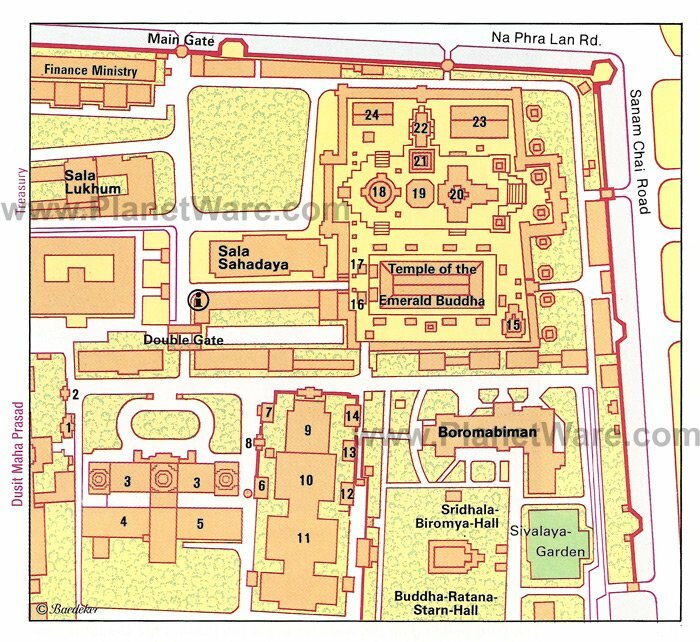 It's also known for being the home to the Jade Buddha - or the Emerald Buddha. During the centuries since it was first built, the palace grounds have been well maintained with particular care being taken to preserve and restore the palace's extensive murals. Though the entrance fee (500 baht) is a bit steeper than most tourist attractions in this country, it's worth the splurge to experience a piece of Thailand's royal history firsthand. In a stark contrast to the spiritual nature of the temple and to traditionally elegant Thai architecture, this holy site is guarded by two imposing demon figures. These statues, gifts from Chinese merchants, stand sentinel at the gate to the gorgeous temple. Those brave enough to pass by the demons are treated to a cycle of murals recounting the epic of "Ramakien" and commentary by King Rama V inscribed on marble plaques nearby. The gold-tiled chedi, known as Phra Si Ratana, contains a relic that (according to tradition) is a bone or hair of the enlightened Buddha. Inside the bot, the small but exquisite statue of the Buddha, less than a meter high, rests on a tall plinth beneath a nine-tiered canopy. According to tradition the nephrite figure was carved in Pataliputra in India, though other sources claim it to be from Burma and the work of an unknown artist. It first came to light in 1434 in Chiang Rai, northern Thailand, having arrived there by way of Ceylon (now Sri Lanka) and Cambodia. At the time of its discovery, the statue was encased in plaster. While in the process of being transported, the casing was damaged and split open, revealing the nephrite figure within. The Buddha traveled a long way to end up in Bangkok in 1778, where it has been kept ever since. Three times a year, the king changes the Buddha's robes during a special ceremony to mark the beginning of a new season. Behind Phra Sri Ratana is Phra Mondhop, a building decorated liberally with tiny glass mosaics. This building holds the "Tripitaka" (Triple Basket) - the sacred scriptures. The scriptures sit on a black lacquered bookcase inlaid with mother-of-pearl, and the floor of the mondhop is made of pure silver. Phra Viharn Yot has the distinction of housing the most ancient of all the treasures in the sacred precinct: a stone that served as a throne for Ramkhamhaeng, the 13th c founder of Thailand. King Mongkut (Rama IV) uncovered the throne, during his years of wandering as a monk, and it was he who brought it to Bangkok. The Prasat Phra Debidorn building is also called the Pantheon. The interior contains life-size statues of the first eight kings of the Chakri dynasty (the present monarch, King Bhumibol, is the ninth member of this dynastic line). But good luck catching a glimpse of the kings - the interior is only open to the general public one day a year, Chakri Day (April 6). If you can't make it to the real Angkor Wat, you can at least see a version of it at the Grand Palace. Admittedly, it's not as impressive as the real thing, but the stone model does offer an interesting history lesson and a glimpse at the landmark as it was being planned. The model dates from the reign of Rama IV, when what is now Cambodia was a vassal state of Siam. Boromabiman Hall is the official name for the building that overlooks the lawns where the king's annual garden party used to be held. Frescos inside depict the four Indian gods (Indra, Yahuma, Varuna and Agni) as guardians of the universe. Inscribed on plaques beneath are the ten royal virtues: liberality, propriety, readiness to make sacrifices, clemency, modesty, conscientiousness, freedom from anger, freedom from suspicion, patience and right dealing. Ever since the time of Rama VI, all the Crown Princes, including King Bhumibol, have grown up here. Nowadays the building is only used occasionally, usually to accommodate visiting heads of state or high-ranking Buddhist dignitaries. Though it is no longer the royal residence (the present king lives at the Chitralada Residence), the Great Chakri Palace is still something special to behold. It was originally designed by an English architect in Italian Renaissance style, but King Rama V ordered that it be embellished with typically Siamese stepped roofs and mondhops. Still, the design is clearly out of place when compared with the other buildings, though it harmonizes with its surroundings when seen by air. As well as being notable for the richness of their interiors, all the rooms in the palace are treasure troves with valuable paintings and portraits of every Thai king. This is the "High Residence" - essentially a throne room where King Rama I once received homage. The hall is still used today, often in ceremonies involving heads of state or for the anniversary celebration of the present king's coronation. You can see a peristyle in front of the building, which is where royal proclamations used to be read. Notice the red and gold posts, where elephants were once tethered. The single large inner hall of this building, which is open to visitors, was originally Rama I's Audience Chamber. Here the king received his guests, seated, not on the large throne seen today, but higher up on a niche-like throne set in the south wing wall. The murals were painted in a later period, when the chamber became used for deceased monarchs lying-in-state. The richly ornamented couch and a number of other individual pieces of furniture do, however, date from Rama I's time. When leaving the Dusit Maha Prasat, the delicate wooden pavilion ahead is the Amphorn Phimok Prasat, used by Rama I as a robing chamber. Having "progressed" here in his litter, the king would change before entering the audience room. Drapes interlaced with gold thread would be drawn while the king donned his ceremonial robes. The Siam: 5-star luxury, private butlers, lovely riverfront lap pool, cooking school, private boat transfers. Riva Surya Bangkok: mid-range riverside resort, comfortable beds, lovely pool with river views, well-equipped gym. Phranakorn-Nornlen Hotel: affordable guesthouse, rooftop restaurant, delicious breakfast, eclectic decor. Villa Phra Sumen Bangkok: budget rates, free Grand Palace tuk-tuk shuttle, stylish rooms, gracious staff. Getting In: Visitors can enter the palace through the Wiseedtschairi Gate ("Gate of Wonderful Victory"), beyond which a wide roadway leads through the outer courtyard. On either side are modern buildings housing government offices. The ticket office is located at the start of the roadway that leads to the actual palace precinct. You pass a building that houses the Museum of Royal Regalia and Coins once you're inside, but be aware that there's an extra charge to enter that museum. The standard admission ticket includes access to Wat Phra Kaeo, The Royal Thai Decorations & Coins Pavilion and Queen Sirikit Museum of Textile, as well as Vimanmek Mansion Museum on Ratchawithi Road. Dress appropriately. As is the case at any temple or palace, visitors are expected to dress modestly. For women, this means covering the shoulders and something that covers a good part of the leg (you can get away with tank tops and short shorts on Khao San Rd, but not here). For men, a t-shirt and pants will do. Flip-flops, see-through clothing, sweats, and the baggy fisherman pants popular among backpackers in Thailand are not allowed. Those whose attire is deemed inappropriate will be given a sarong to wear, but you may be asked to turn over some form of ID (such as a passport) for security. Beware of scams. Because the Grand Palace is a major tourist attraction, it also draws scammers like bees to honey. If someone approaches and tells you the palace is closed or they have another attraction to show you, politely shake your head and keep walking. No matter how sweet a package they are offering, chances are you're about to be duped, big time. Only buy tickets at the official ticket counter, not from "guides" on the street.